Purposeful Clouds: Will NaaS and Mobile Cloud Computing test sky limits? Will NaaS and Mobile Cloud Computing test sky limits? While visiting our daughter just before the start of this year's school season and touring Philadelphia, she showed us a local corner coffee shop where she, a proud summer intern scientist, and her scientist boss did a good part of their summer research work for a Fortune 100 company using cafe's free WiFi. This addressed our summer long confusion as to why we could not find company's Philadelphia office address. The fact that mobility is essential to our lives is obvious and evident with the pervasive use of mobile devices such as smart phones, tablets, mobile clients and desktops in enterprises, and public places such as coffee shops, parks, buses, trains, libraries, campuses to name just few. Then there are recent forecasts of up to 50 billion mobile connected "machines" over the coming years, including appliances, smart meters, security systems, healthcare devices, etc. Let us see if we can understand how this phenomenon has been unfolding and its relationship to Cloud Computing. Cloud Computing has already been extended well into the mobile domain. For example, both Apple and Google offer mobile services, devices, OSs, APIs and use IaaS, PaaS and SaaS driven Cloud Computing services coupled with a powerful and fast expanding ecosystem of developers and partners. Both companies offer ubiquitous mobile access by using some combination of the wireless networks of Mobile Network Operators (MNOs) such as AT&T Mobility, Verizon Wireless, China Mobile, Orange, Airtel, Singtel, T-Mobil, etc. around the world. Most of these so called "mobile services" offered on their platforms are still just Web-based client-server applications and use no more than wireless communications capability of the MNOs. Without a doubt, mobile business growth of Apple and Google in the market is phenomenal, however, this represents just the first wave of mobility success. To develop a good feel for how the new wave of mobility growth is unfolding, we need to understand the role and assets of MNOs and associated business opportunities. So far, MNOs delivering broadband mobile networks has been the essential and key enabler to the mobile applications usage growth. MNOs also have vast subscriber base representing huge assets that are mostly unused and ripe for building new and innovative businesses. For example, MNO's store better managed and controlled information on their subscribers than most of today's social networks or even the banks. There is tremendous information and intelligence embedded in their subscriber usage of voice calls, text/multimedia messages, location, profiles, used or free minutes/messages, etc. Another major MNO asset is their highly scalable and mature payment systems that have the ability to handle micro-payments. The ability to contractually track and transact on all the line items, for example, in a monthly mobile phone bill that may include roaming, voice, data, messages and other cross carrier micro charges, taxes, and then managing charges in different currencies is quite impressive. Now if you consider, for example, how many hundreds of millions of credits cards Apple must be managing for various mobile applications and related services sold on their App Store and then compare this with MNO payment system's ability to potentially support in-line applications targeted at billions of subscribers with their comprehensive payment system, it gets even more impressive. A developer to know how he or she will get paid with the tracking features of a MNO payment system in a worldwide cross carrier environment can be quite assuring and exciting. So where is the industry in tapping the unused MNO assets? Telecom operators have learnt from the success of SaaS Cloud business model and they are delivering, in the same way, on-demand "Network as a Service" offering, also called Telco 2.0. Information, intelligence, communications, payment system and billable customer base are huge marketable assets that can be offered to third parties. These assets are now getting exposed through a set of APIs to a large community of developers, ASPs and other service providers. For example, progress made with GSMA OneAPI platform focused at the development of applications while Wholesale Application Community (WAC) defining an architecture for delivery of mobile applications across multiple platforms and networks is helping accelerate the realization of on-demand in-line mobile applications and services. We know that MNOs have been delivering services such as SMS, MMS, IVR, user alerts, chat, MNP (Mobile Number Portability), etc. A good example of such an MNO is Orange. The good news is that delivery of these services have given MNOs the required experience in building business models that are scalable and sustainable and they deliver valuable services to their subscribers. But the not so good news is that most of the MNOs use proprietary APIs that work only withing their network. As MNOs, ASPs, and developers work together in using both industry standard APIs and architectures as well as deliver on more differentiated proprietary capabilities, we will see access to the range of on-demand capabilities inherent in worldwide mobile network platform in the form of Mobile Cloud Computing where sky is the limit. 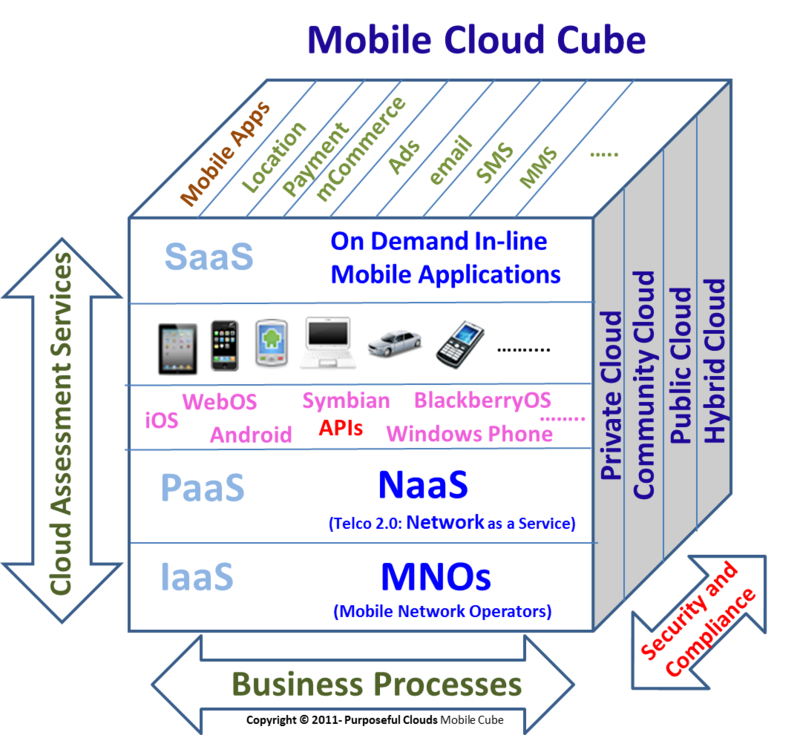 We have extended the Purposeful Clouds Cloud Computing cube into the mobile domain. Now back to our lives, we know that most college students get limited sleep which worries parents. However, we like the fact that our daughter can visit us more often by completing her school work using WiFi in a late night seven hours bus trip between Philadelphia and Boston. Should we thank or blame mobility for this, seriously? 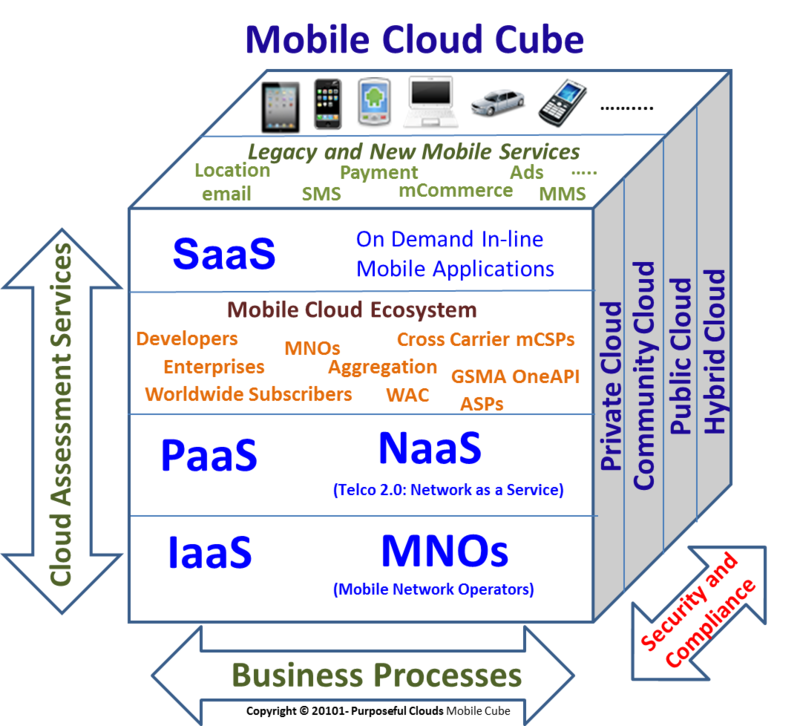 In my next blog on this topic, I will talk about Mobile Cloud Service Providers (mCSPs). Such a clear view on how Salesforce is related to Cloud Computing, hope your blog will reach more visitors who are all searching for the Cloud and Salesforce related updates.